Here we are… the last Eat Seasonally post of 2018! 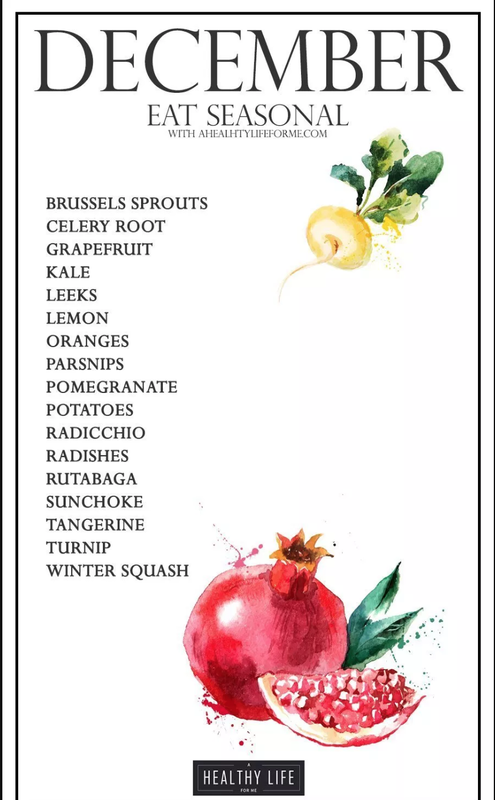 December’s list of seasonal produce is short, but sweet! Many of the foods are literally sweet. All citrus is prime during this season, as well as pomegranates AND parsnips, squash and celery root are all in season, which I would say are pretty sweet for being vegetables. Oranges: We all know oranges have vitamin C, which makes them great for immunity boosters. Which, (not ironically) helps out with the seasonal cold and flu. Oranges also have a low glycemic index, which make them a great food for weight control. Oranges have also been shown to help prevent cardiovascular disease because they have potassium, folate and and vitamin C which all help with lowering cholesterol and preventing stroke and arrhythmias. Pomegranates: Pomegranates have been shown to help with memory and brain health. Also, studies have shown that a consistent consumption of pomegranate can help lower cholesterol. Pomegranates are a funny fruit. The seeds are not necessarily easy to “harvest,” but are so worth it! My tips are to cut the pomegranate in quarters, and use your thumb to push out the seeds into a bowl. Then sift through the bowl and pull out all of the extra white pulp. If that seems too hard, you can always buy the seeds already picked out. You can usually find them in the produce area, often by the pre cut and packaged fruit. Mix garlic powder, cayenne, fennel seed, salt and pepper. Season outside of salmon with spice mix. Heat 1 tsp ghee/avocado oil in a saute pan over high heat. Add salmon. Sear each side for about 1-2 minutes each. Reduce heat, pour in white wine vinegar and lime juice. Cook salmon until cooked through. Meanwhile, make salsa by combining pomegranate seeds, oranges, 1 TBSP lime juice, onion, cilantro, jalapeno, cumin, and 2 TBSP olive oil. Mix together and set aside. We served this salmon with quinoa and sautéed green beans!